Les Gets lies in the Massif du Chablais, just below Lac Léman (aka Lake Geneva). The often substantial snowfalls combined with predominantly north-facing slopes go some way towards offsetting the comparatively modest altitudes. 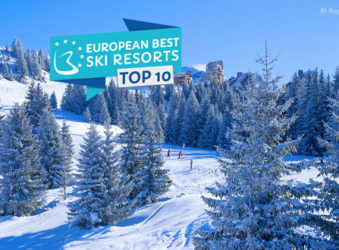 Just a 15min drive from the A40 motorway exit at Cluses (which has high-speed rail links from Paris) and around an hour’s transfer from Geneva airport, Les Gets and the neighbouring Portes du Soleil ski villages are firm favourites with travellers from the UK. Part of the vast Portes du Soleil ski area. 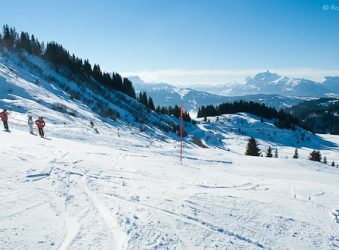 The local Les Gets Morzine slopes may be enough to entertain most skiers. 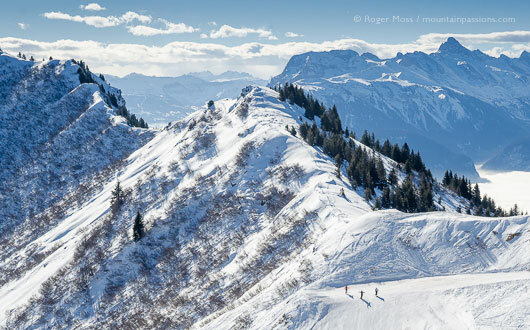 With access to 600 km of slopes spread across 12 villages in both France and Switzerland, the vast Portes du Soleil area offers near-limitless skiing amid fantastic scenery. Border crossings are seamless. Les Gets’ own pistes are spread across both sides of the village’s valley location, each side topping-off at around 1825m, while two chairlift hauls (one, if snow cover is good) will get you to Red- and Blue-graded runs into neighbouring Morzine. There’s rapid gondola access to the pistes of Mont-Chéry for some good, north-facing onward (red- and black-graded) drops into L’Encraz – plus less-steep, south-facing return cruises. It’s a fun way to start the day but, distance-wise, the more obvious attractions lie above the opposite side of the village in the Chavannes sector. Only the upper slopes here are above the tree-line, so there’s lots of useful shelter in less-than-perfect visibility, along with a refreshing sense of getting back to nature. 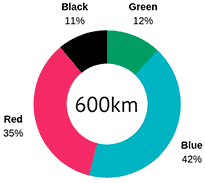 Although the figures might suggest otherwise, intermediates won’t find it too daunting here, while novices have plenty of facilities to ensure a confident start. 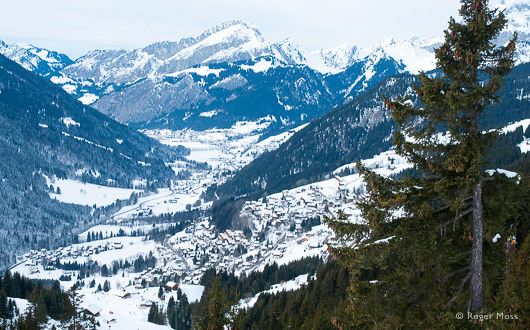 Long-established ski village with traditional Alpine feel. Varied accommodation with nice range of small hotels at the foot of the slopes. 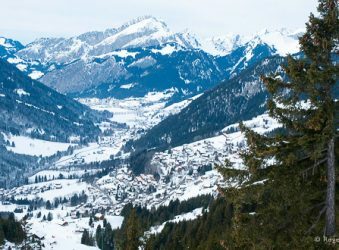 Although regarding itself as small, Les Gets has a reassuringly established feel to it and offers a refreshingly traditional alternative to high-altitude purpose-built resorts. It developed around the Col des Gets (1170m) and became a ski resort in 1936. Both architecturally and culturally you somehow sense that Switzerland is nearby. After fresh snowfalls the heart of the village looks and feels like something from a Christmas card. Not that it’s in any way unsophisticated; quite the reverse, in fact - but nicely so. Ski boutiques (and boutique chalet hotels) tell their own story, yet Les Gets remains a friendly, down-to-earth place to spend some time, and has a particularly loyal following among skiers from the UK. Access to the ski-lifts couldn’t be easier – and you can take ‘le petit train’ rather than wait for the next shuttle-bus between access points on opposite sides of the village. Now that’s different. 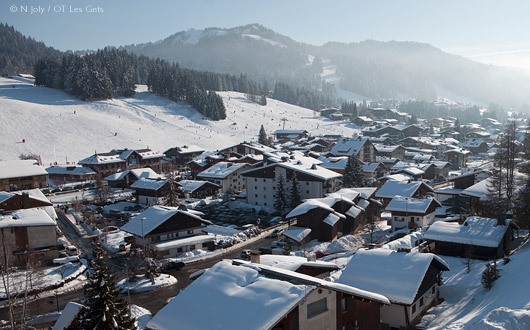 Why go skiing in Les Gets / Morzine ? 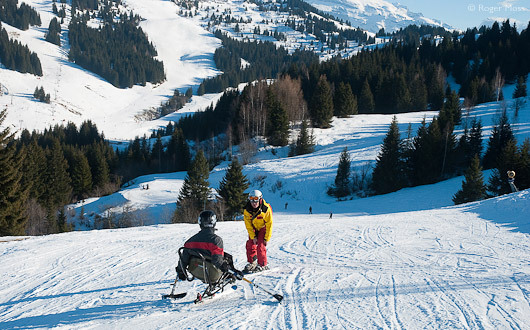 As a Famille Plus Montagne resort, Les Gets provides activities and services for all ages plus skiers with a disability. 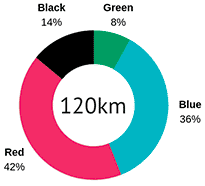 Mixed-ability groups will find variety locally, but will need to build their fitness levels if they intend really covering some distance and exploring the Portes du Soleil’s full potential. It really is vast. Closer to home lie obvious opportunities for those looking to develop not only their stamina but also their technical abilities – and if you’re happy skiing red-graded runs (or are ready to step up) then you’ll be spoilt for choice. Finally, for independent travellers there’s a wealth of luxury accommodation options – both hotels as well as chalets. Plenty of fun for all levels. Video park with videototem. Varied trails on Mont Chéry and Chavannes sectors. Discounted Les Gets/Morzine ski pass for a disabled skier and their companion (conditions apply). Accessible public toilets at the Tourist Office, near the foot of the slopes. Access to the Mont Chéry gondola for panoramic views of the Mont Blanc mountain chain at the summit. Good snow record, snow making and well-prepared pistes. Famille Plus resort which welcomes children and offers numerous facilities adapted to all age groups plus specific services and children’s activities, both on the piste and in the village. 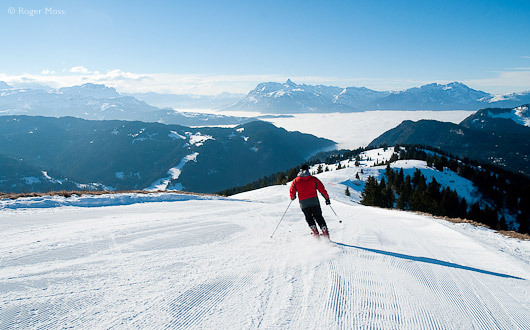 All inclusive adults only beginners' ski packages "YouCanSki", available throughout Portes du Soleil, see esf-letgets.com. Capable lift system with hands-free passes. Electric car charging points and lift pass reductions for their owners. Exploring the Portes du Soleil’s full potential from Les Gets requires stamina and determination but is possible for confident skiers. 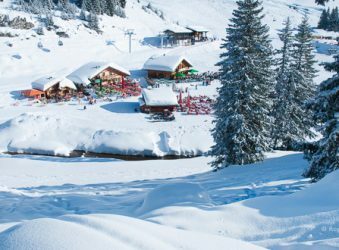 There's plenty of great skiing on the Les Gets/Morzine slopes if you want to save money or are not confident you will make full use of a Portes du Soleil pass. 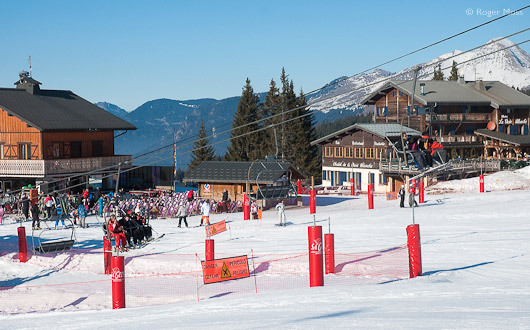 A welcoming, cosy chalet hotel situated opposite the Chavannes express chairlift. There's a spacious, comfortable lounge bar where you can enjoy an après ski drink or pre-dinner cocktail. 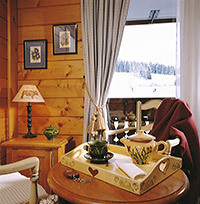 The restaurant offers views towards the slopes and serves half-board guests with classic and traditional French menus. An exceptional breakfast includes home-made patisserie and conserves plus a variety of breads, cheeses, ham and freshly-squeezed juice. The coffee is also excellent. The hotel has its own pool and spa with Jacuzzi, hammam and sauna. Although in a separate building, it is easily accessible from the hotel via an underground passageway. We stayed in one of the hotels 'superior' rooms, a corner room with dual-aspect views and large balcony with mountain views. There is a high level of comfort, with easy chairs, desk, and a large bed made up with soft white cotton sheets, quilt, good pillows and eiderdowns. Each room has free wifi access. In short, a superb place to stay (and feel very comfortable indeed). Every Thursday artisan chocolatier Isabelle Asselin shares her passion in informal chocolate workshops. Anyone from 5 years upwards can join in and create their own chocolate confection to take away. Great fun, and the end product is delicious. The talented Bonhomme sisters workshop faces Mont Blanc and is half pottery, half sheep farm. Anouk throws the clay and Natalie decorates the pieces using natural minerals and pigments. Their pottery has a pure and delicate style. Visits to the pottery during the lambing season in February never fails to delight children and parents alike. Les Gets is a lively village with plenty of shops, bars and restaurants. Most restaurants serve traditional Savoyard dishes but there are also several crêperies and a large choice of places to get pizzas. On-mountain restaurant with a fabulous menu ranging from traditional style to spare ribs. There's an outdoor grill for meat dishes and a wonderful display of home- made desserts that will tempt anyone. The salads are great for a lighter meal - a small salad is still generous and leaves room for dessert. We enjoyed grilled chicken served with crozets, fennel and mange-tous followed by a Black Forest gateau, and a goats cheese salad with a very light fruit cheesecake with an orange and mango sauce. Main courses around 20€. Surprisingly, no vegetarian meals on the menu (you have to ask). Specialises in Savoyard dishes served in modern chalet-style building with a great intimate atmosphere inside, and heated outside terrace. The staff are attentive and orders are taken and delivered efficiently. We ordered a vegetarian tartiflette and a Berthoud (Abondance cheese melted with Porto and garlic) served with potatoes and salad. Both were delicious and cost 12€ and 16€ respectively. Expect to pay 20-30€ for steaks or duck, served with a choice of delicious sauces. A great place to go, particularly if you have vegetarians in your party. It's popular, so reservations advisable. Visit the local cheese-maker at the fromagerie. We visited in the morning to see the cheese being made. You can taste and buy a tempting variety of cheeses in the shop. For an authentic experience, book a table in the restaurant, which is located in the old cheese maturing cave. On the menu are Savoyard cheese-based dishes, served in vaulted dining rooms high in retro ambiance and certain to provide a memorable evening. Popular local bar/restaurant in the heart of the village and serving a range of good quality traditional dishes and pizzas. Great for solid-value family meals or informal evenings with friends. Pizzas from around €8.50. Take the A40 direction Chamonix and exit at Cluses. Follow signs for Tanninges on the D902, then head for Les Gets. 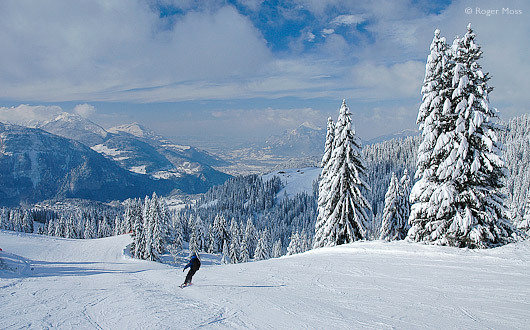 The cheapest and quickest way to reach the Portes du Soleil from the UK is via a low cost flight to Geneva (55km from Les Gets). For the Portes du Soleil travel by Eurostar from London to Paris then to Cluses(4½ hrs) or Geneva (3½ hrs). Our early evening approach to Les Gets gives little idea of the setting or how it might all look in daylight. But there’s no denying that the heart of the village looks a picture twinkling appealingly in the chill darkness, while mounds of snow are piled up at the roadsides. It’s visibly upmarket too, as our check-in at the Hotel Marmotte confirms; when your first visit makes you feel more like an old friend making a welcome return you know you’re in good hands. When your first visit makes you feel more like an old friend making a welcome return you know you’re in good hands. The wide slopes are perfect for carving and there's plenty of time to admire the scenery. The teepee village with obstacles and bumps provides lots of fun for children. We sleep soundly and awake to brilliant sunlight. It’s been some time since the most recent snowfalls but a combination of exceptionally low temperatures and skilled piste management (with judicious use of snowmaking) has kept things in good shape for skiers. Nevertheless we make an early start, and climb aboard le petit train – an interesting alternative to the usual shuttle-bus, which drops us on the opposite side of town at the Mont Chéry gondola lift. It’s a good place to begin, since snow-quality on the mostly south-facing slopes holds up less well than across the valley. After the gondola ride a quick transfer to the Pointe chairlift gets us to the 1826m mark to add our tracks to the neatly-groomed corduroy of Marmotte. The red-graded piste crests a top-of-the-world ridge benignly before spearing off right onto a breathless plunge down through the trees into L’Encrenaz. It’s still cold down below so snow quality is good, rewarding us for our early start. There are a couple of black-graded access runs on this side too but our time is limited, so we ski back to the gondola and down to the village. Next time we’ll make a point of taking the Grande Ourse chairlift or the Super Chéry draglift, which serve a slalom piste, plus further red and black runs down through the trees to the Planeys chairlift. There’s more skiing over here than you’d imagine, and since most skiers are focused elsewhere it can be a good place to head for low-pressure skiing when temperatures are low – which usually means in the mornings. The lower slopes of the Les Gets ski area run right down to the village. Mid-mountain, a secure and sunny beginners area is perfect for making those first turns on skis. Meanwhile, back at the base of the gondola, another slightly surreal ride on the shuttle-train gets us back to our starting-point. Having got Mont Chéry out of our system, we now take the Chavannes Express chairlift and during the ride check out the Déborah Anthionaz boardercross run, one of the longest we’ve seen. Turning left at the top of the lift (at 1620m) offers a red-graded run into Morzine (or a Blue, via the Folliets du Golf chair), but we head the other way to ski the blue-graded Violette piste over to the next chairlift, the Ranfoilly Express, which whisks us up to the 1826m summit of Le Ranfoilly. The views from here are fantastic, as is the scenic cruise on the red-graded Tulipe over to the La Rosta 4-seater chairlift serving another great panoramic viewpoint: the 1665m summit of La Rosta, from which there are blue- red- and black-graded descents. Our choice is the Eglanine red, which falls away to enter the tree-line above the base of the La Rosta sector’s chairlifts. This time we take the la Rosta lift’s companion, the Grains d’Or Express up to the Pointe de la Turche (1633m) to take Vorosses, a blue-graded piste which we soon leave to join a red. The aptly-named Mélèzes (‘larch trees’) fires us down the Perrières Express six-seater chairlift. From the top it’s just a minute or so’s gentle run down to our lunch-break target. The Restaurant La Païka is the classic mountain hideaway and the fine weather finds the terrace filled with appreciative skiers pondering the temptations of the today’s chalkboard menus. Grilled chicken from the barbecue gets our order. Access to the restaurant is via the blue-graded Vorosses piste, so leaving means finishing the run – the lower section of which turns out to be a quite icy when we tackle it – all the way down to the welcome sight of the antique Turche draglift. This modest but important lift dates from 1945, and is still both privately owned and operated (such is its fame that it even has its own Facebook page). After launching out from the covered departure area we climb steeply through the trees for a 1.2km-long haul, with a vertical ascent of around 330m. When we finally wobble off gratefully at the top a gentle blue cruise on Renardière marks the start of our return journey to the village. 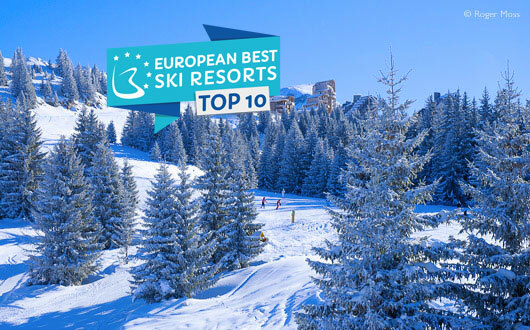 Dedicated to preserving its mountain environment, many eco-initiatives have been introduced in both Les Gets village and the ski area including low emission transport, distribution of pocket ashtrays, electric car recharging points with a reduced price lift pass for skiers. Even events at the resort are planned to minimise their environmental footprint. There are a huge number of ongoing projects planned in an environmental strategy to reinforce the resort “Eco-station” label. Proposals include better storage and use of water resources, waste reduction, building controls, conserving natural areas and protected species and the support of local businesses and traditions. 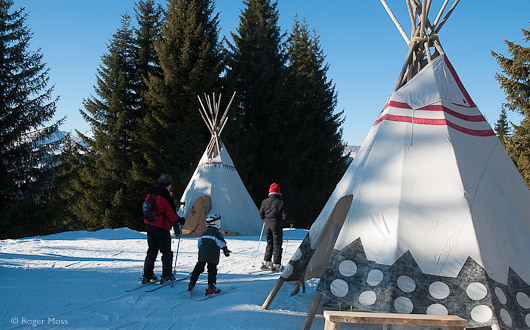 The route passes the Mappy’s novice area, the Anthionaz boardercross area and the new Territoire Grand Cry – an American Indian-style childrens’ village complete with tepees, a mini boarder/skiercross run with sound system, plus activities including war-paint face-painting, treasure hunts and drawing competitions. It’s a fun place which is designed to entertain the mountain visitors of the future. Next comes the Nauchets Express chairlift, which hauls us high above the Stade de Slalom to the start of a blue-graded run down Gentianes. 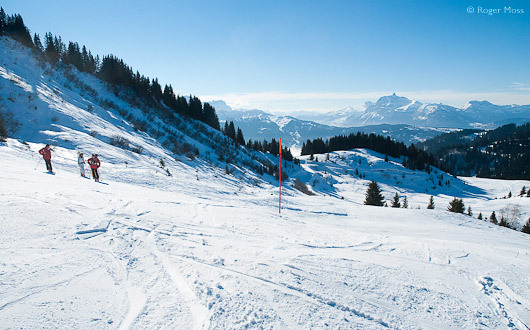 Almost before we know it we’re back to our starting point, after a rewarding day’s skiing on the pistes above Les Gets. Evening finds us in a fittingly mellow, satisfied mood in which to enjoy the simple pleasure of being here, in what has already begun to feel like a genuine home-from-home. First run of the day, high above the mists hanging down in the nearby valleys.